One of the first inventors, who tried to change this disappointing situation was Frank Baldwin (1838-1925) (see biography of Frank Baldwin) of St. Louis, Missouri, who in 1873 rented a small shop in Philadelphia and started to make ten of his calculating machines, based on “pin wheel” or “variable cog” mechanism. Baldwin definitely was not the inventor of this mechanism, as he claims later on. As you can see in other pages in this site, first similar design was most probably created by Leibniz in 1672, then reinvented by Poleni in 1709, Braun in 1727, Staffel, Roth and Wertheimber in 1840s. It is unknown however if Baldwin knew about the other inventors, but especially the machine of Staffel was well-known in the english speaking world after its success in the Great Exhibition in London in 1851. 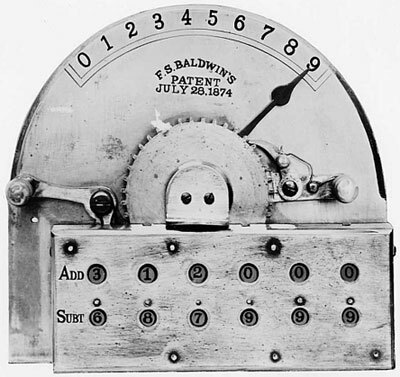 Together with this machine, Baldwin designed a simpler one—adding device (see the figure below), which the inventor named Arithmometer, and which later on was successfully manufactured and sold, although in small numbers. His first patent by the United States Patent Office Baldwin received namely for the Arithmometer in 1874 (US patent 153522). Later on in 1900 he will take out another patent for an adding device. In the same 1874 Baldwin placed both machines on an exhibition at the Franklin Institute, where a committee of John Nystrom, John Groesbeck, and Pliny Earle Chase commented favorably on the smaller machine. That's why it was awarded the John Scott Medal for the most meritorious invention of the year 1874. Later on Baldwin managed to sell one of his machines to an railroad office. The machine proved to be very useful and reliable. It was a steel and brass device, with mearurements: 2 cm x 13 cm x 11.3 cm. The device's back is roughly a half-disc, with the digits from 0 to 9 engraved across the top. A steel arrow rotates to point to any one of these digits. Rotating a brass knob returns the arrow to place. 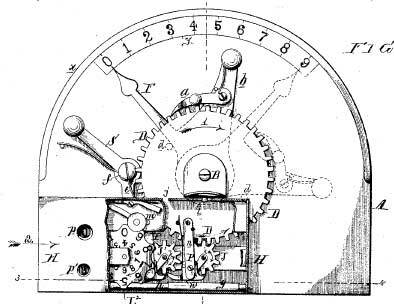 The knob is linked by gears to a small movable carriage at the base of the device. Returning the knob to its original position rotates two small register wheels. 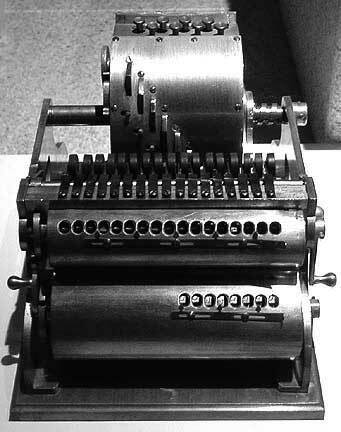 One of the wheels records the sum of the number entered and the number already set in the wheels (used in addition). The other records the complement of this number (used in subtration). There are four sets of register wheels, linked to one another so that the machine carries, thus the machine can add numbers up to 9999. The second patent granted to Baldwin in 1875 (US patent 159244), was for the pin-wheel machine. 1. The counter drums (marked with E in the patent drawing), which consist of a basic drum, containing the teeth h, and sector segment F. In normal position the teeth are hidden in the body of the drum by means of a spring. If the sector segment F will be rotated by means of the lever g, then one or more teeth will be pushed out of the body of the drum by the springs, and the number of these teeth will depend on the angle of rotation of the segment. Thus during the rotation of the crank, which rotates the pin-wheel drum, different number of teeth will be engaged with the pinion M, and different number will be transferred to the resulting mechanism. 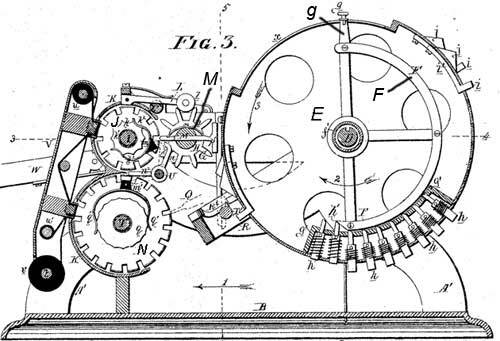 The mechanism with the counter drums is separated from the other mechanisms and can be moved leftwards and rightwards by means of a slider (in contrast for example of the other famous machine of this class, Odhner's, in which mechanism can be rotated not counter, but registering mechanism). This movement is necessary during the multiplication and division. 2. After the number has been entered, then must be rotated to one revolution the main handle and 9-teeth registering drums J will be rotated to so many steps, according to the erected teeth of the particular counter drum. 3. Another group of registering drums N is connected with the mechanism in such manner, that it serves as a revolution-counter of the particular counter-drum, which is necessary on multiplication and division. In his first patent Baldwin proposed also a ribbon-printing device to be used fro printing the result on paper. This idea however will be realized as late as 1908, when was patented Baldwin Recording Calculator, which combined the listing machine with the calculator. After the successful sale of first 10 produced manually devices, Baldwin tried to manufacture and sell his machine in factory, but without success. The demand of such machines was too low yet. Frank Baldwin tried to improve his machine and was granted with other patents, in 1902 and 1904 for improved pin-wheel machine, in 1905 for a machine with a keyboard (see the photo below), and in 1908 for the above mentioned machine with a printing mechanism. 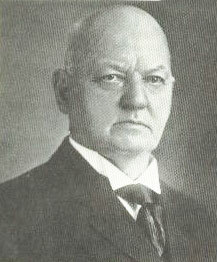 The success came to Baldwin at the end of his life, in 1911, when he received a financial support from the young businessman Jay Randolph Monroe (1883-1937), and in 1912 they created the Monroe Calculator Company. 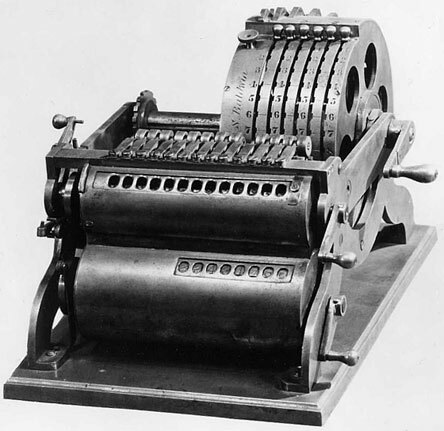 Baldwin had developed a machine which combined the best features of the calculators of the time—the four-function arithmetic capabilities of the stepped-drum and pin-wheel machines, and the rapid keyboard setting of the key-driven Comptometer. Monroe recognized the possibilities, and established a company to bring the machine to market.